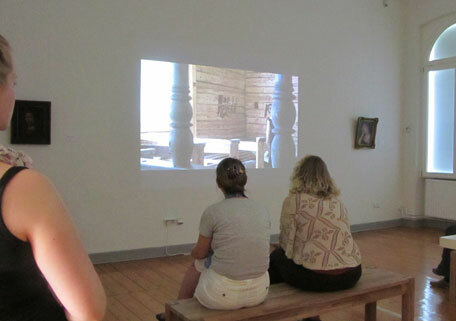 For the first time, we exhibited videos from the Mère Folle Project among Old Master paintings, in what is known as the best university-based art museum in Germany. What makes this museum special, in addition to its outstanding collection, is the recent foundation of a video collection. The point of this collection is to demonstrate the affiliation between painting and video. The museum acquired the five videos we exhibited in this small but exquisite show, curated by museum director Anne-Katrin Sors. Here you see Anne-Katrin handling precious objects from the collection with concentration and dedication. For us, this was an opportunity to make our own statement about that affiliation. For this reason, we had selected five videos without dialogue. One of these is rather loud. Folly Resurfaces combines the Basel Carnaval, with its ancient musical tradition, with our scene in the hospital garden, when the medieval Fools irrupt amongst the mad patients. Both Basel and this scene make a political argument about the fundamental uncertainty of madness. 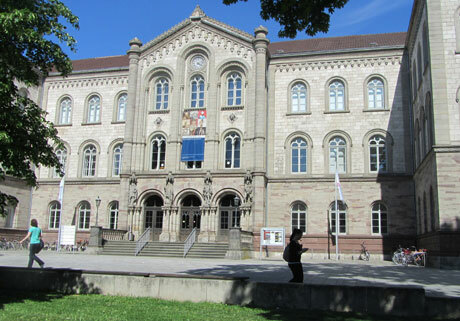 A University Museum not only shows the history of the university. It also attempts to connect learning, as the students are there to do, with the contemplation of the history of art. To place video works, especially the selected ones that depend entirely on their audio-visual quality, with implicit but artistically constructed intellectual content, in such a place is, we thought, a new challenge to our conception of art as social, and video as an excellent medium to make “theoretical fictions”. Click on the link below to see installation shots. these are not very informative as such - due to lighting conditions - but give a sense of the combination of old and new and the atmosphere of historicity it yields. In the following photo gallery you see a video still of these works combined with an installation view in the Kunstsammlung.